A convenient way to sample a collection of varying cigar blends made exclusively for King Corona Cigars. The Sampler Pack contains one of each of our blends --Ybor City Handmades, Light of Ybor, Puro Placer, Nicaraguan Suenos, and Don Barco. King Coronas house-blends are manufactured according to specifications by Cuban experts in Nicaragua who have been growing tobacco and manufacturing cigars in both Nicaragua and Cuba for over 100 years. - THE DON BARCO The Don Barco cigar is a very rich, yet smooth, smoke with great balance of flavor. Handmade in Nicaragua, the Don Barco has an exquisitely beautiful Habano Ecuadorian wrapper. The long leaf filler and binder leaves are from the Esteli and Jalapa regions of Nicaragua, two of the most prestigious tobacco growing areas of Nicaragua. Oily with a beautiful sheen, the The Don Barco wrapper is prized among cigar makers. The grain of this wrapper makes it a most valuable component in producing only the finest of cigars that burn with a beautiful white ash -the mark of a great wrapper. Put all of these fine components together and the result is a truly fine cigar. - PURO PLACER (pure pleasure) The Puro Placer is the epitome of smoothness and mildness, yet bursting with flavor and is handmade in Nicaragua. Puro placer literally means pure pleasure Puro&rdquo; in Spanish means pure&rdquo; and is a slang word in Latin America for a really good cigar. The Puro Placer blend is both mild and flavorful. The mildness comes from the Shade Wrapper, the flavor comes from the Nicaraguan Seco and Ligero filler leaves. Only the finest quality tobaccos are used in the making of this fine blend. The Puro Placer is priced very low considering the quality of this cigar. Many similar cigars are priced in the $6-$12 range. 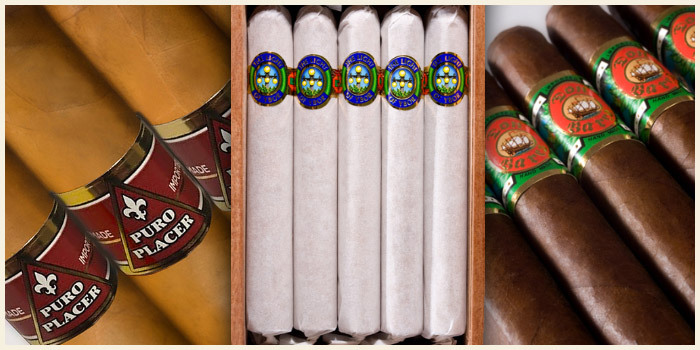 -YBOR CITY HANDMADES These tremendous cigars are made using tobaccos from Nicaragua and Ecuador, providing an exquisitely mild to medium flavor and body. A great value priced cigar that smokes like a much higher priced cigar and is consistently our best selling item. My husband really enjoys the cigars. We enjoy listening to music on the porch with a little wine and he has his cigars! Perfect relaxation for him after a hectic day. Best handmades at an affordable price. I've purchased these ever since I visited Ybor last year. Great find and I'll continue to buy. My husband loves this combo! These cigars are amazing. I am one satisfied customer. It was fast on delivery!!! I look forward too purchasing more! 3 of the 5 cigars I smoked were very dry and poor burn. I had the items for only 1 week. The best was the Don Barco.